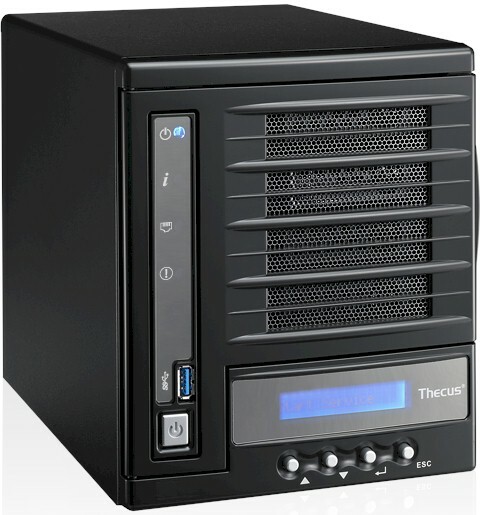 Summary Intel Evansport Atom four-bay RAID 5 NAS focused on home users running new Thecus OS. In August, Thecus announced two new NASes aimed at the home multimedia user. Scott reviewed the N2560, a two bay BYOD NAS, and concluded that its performance was not a good as other dual-core Intel Atom-based processors. This review focuses on the N4560 - a four bay NAS built on a hardware platform similar to the N2560's. Not surprisingly, the N4560 turned in lower performance than other four-bay NASes with dual-core Intel Atom processors. Though the N4560 shares the same components with the N2560, the N4560 isn't just a four bay version of its two-bay sibling. Whereas the N2560 features a white case with a Thecus logo system status LED on the left side of the case, the N4560 ships with a more conventional black case and has a front panel LCD display. In our testing, we noted that the LCD panel is deeply recessed and can't be read unless you look at it directly horizontally. Like other Thecus NASes, individual drive activity/RAID failure LEDs are built into the drive trays. So these are hidden until you swing open the cover. The front panel has four LED indicators arranged vertically along the left side. I like that there's a LAN activity indicator. The single USB 3.0 port is conveniently located on the front panel where you can attach cameras or USB drives. Unlike the N2560 that uses an external brick-like power supply, the 4560's power supply, including a fan, is built into the case. The rear panel has two USB 2.0 ports, Gigabit Ethernet port, SPDIF audio out jack and HDMI port for console or media output. You can download XBMC to get some of the features you'd find on a HTPC. I touched on this feature briefly when I reviewed the new operating system, ThecusOS6. Like the N2560, the N4560 lacks an eSATA port.